After these two error messages pop up, the program continues to load and seems to run fine. I have googled both these messages and cannot find anything definite to explaine what thgey are about or how to solve the issues. Any help would be appreciated! Sorry, I don't have a solution. Both of these errors are from Windows. Perhaps you don't have much (enough free) hard drive space available. You might also a try a complete shut-down of your computer, then start up fresh. This will clear your memory. Well, thanks for looking at the issue. What really has me stumped is the .nbp and .nbr files in the temp directory. Tonight I watched the temp folder while starting up the MilCampground program. 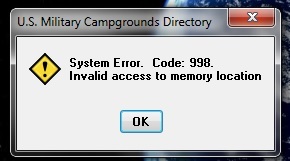 The temp file (and other associated files) referenced in the error message were created when MilCampground was started. When I closed MilCampground, the temp files deleted themselves. I certainly can't explain that. I came to the conclusion that I might have picked up a trojan somewhere along the way. So, I restored an old image backup of my system. It had MilCampground v. 1.04. I downloaded the updates and ran the program. Works fine. No error messages. So, whatever was going on doesn't seem to be an issue anymore. I'm a happy camper again. Great, I'm glad all is working well again. The .nbp, .nbi, and .nbj file extensions are part of the Directory software. These are temporary working files that contains much of the data. They are legit.